President Obama is scheduled to attend the eleventh G-20 meeting in Hangzhou, China from September 4 to 5, 2016. The summit is the final G-20 gathering President Obama will attend and possibly his last trip to China in his capacity as President of the United States. The theme of the summit is “Toward an Innovative, Invigorated, Interconnected and Inclusive World Economy” and UHRP asks President Obama to urge Chinese President Xi Jinping during scheduled “in-depth” side meetings that the foundation of a successful global economy is an adherence to internationally agreed human rights norms. “The G-20 Summit should represent an opportunity for President Obama to set the right tone to the Sino-American relationship as he enters the last months of his presidency and not allow President Xi to grandstand for a domestic audience. President Obama must publicly express alarm over militarization of East Turkestan under Xi Jinping administration and dismay over deteriorating human rights conditions in East Turkestan,” said UHRP Executive Director Mr. Alim Seytoff. 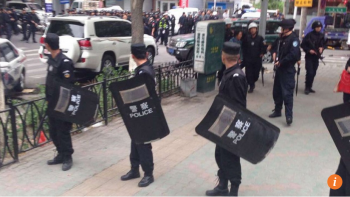 According to a report published by Reuters on August 16, 2016, China’s recent counter-terror exercises were conducted in the Uyghur cities of Kashgar, Hotan and Aksu in southern East Turkestan. Over 3,000 personnel participated in the exercises, which included evaluation of assault helicopters and all-terrain assault vehicles. The report, citing Chinese state media, added the training was initiated to assess the “battle capability of anti-terror equipment.” UHRP is concerned about such militaristic language that views conditions in East Turkestan as a “battle,” especially since credible reports exist of extrajudicial use of force against peaceful Uyghur civilians. Ask for a scaling down of the military presence in East Turkestan in order to encourage political stability in the region. Restate the State Department’s skepticism over Chinese claims of “Uyghur terrorism,” as outlined in the 2015 Country Reports on Terrorism. Express unease over the curbs placed on legitimate religious practices and political activism in recent nationaland regional counterterror legislation. Raise concerns over curbs placed on Uyghur religious rights highlighted in the State Department’s 2015 International Religious Freedom Report, which records how: “Human rights organizations stated police shot and killed Uighur Muslims during house raids and protests after conflicts arose due to stricter government controls on religious expression and practice. Ask China if there have been any measures taken to address Uyghur human rights issues documented in the State Department’s Country Reports on Human Rights Practices for 2015. Urge China to leverage the One Belt, One Road initiative as a means for Uyghurs to participate in an “innovative, invigorated, interconnected and inclusive world economy,” rather than as an opportunity to appropriate resources and sideline Uyghurs from sharing in the benefits of economic development. Request China abide by the international human rights standards contained within the Universal Declaration of Human Rights, in particular the rights to freedom of speech, assembly and association.